Chesapeake, VA -- Rising singer A'Saun is taking leaps of faith and stepping into the spotlight song by song. The emerging vocalist is a single father of two sons and a United States Air Force Sergeant who serves fervently in his home church The Mount Cathedral in Chesapeake, VA. Adding Gospel music solo artist to his resume is becoming a natural fit for him. With a desire to contribute to his community and to minister hope from a transparent, real-life perspective, A’Saun is successfully recording music that reflects his own personal worship and relationship with the Father. His debut single release "Amazed", gave the singer a solid introduction to Gospel music fans and to the Gospel music industry. His follow-up single "Days of Elijah" is a corporate worship favorite and is executed by A'saun with vocal finesse and with a pure heart. "I remember singing this song for the first time back in 2007 on my praise team while stationed in the UK," A'Saun shares. "Days of Elijah shows a different side of my artistry and gives more insight to who I am and what I’m truly about." "I chose to record 'Days Of Elijah' because I love to talk about God! It must be that church boy in me," he continues. "There is happiness that comes over me when I begin to talk about His Goodness, Power, Provision, Love, and His Word! I’m really excited that God is truly blessing me and moving on my behalf in this season and I want to share that with the world through my music." A'saun is an artist under the development helm of Stellar Award-winning singer, songwriter, choirmaster, and international artist Earl Bynum and his Lrae Entertainment record label. 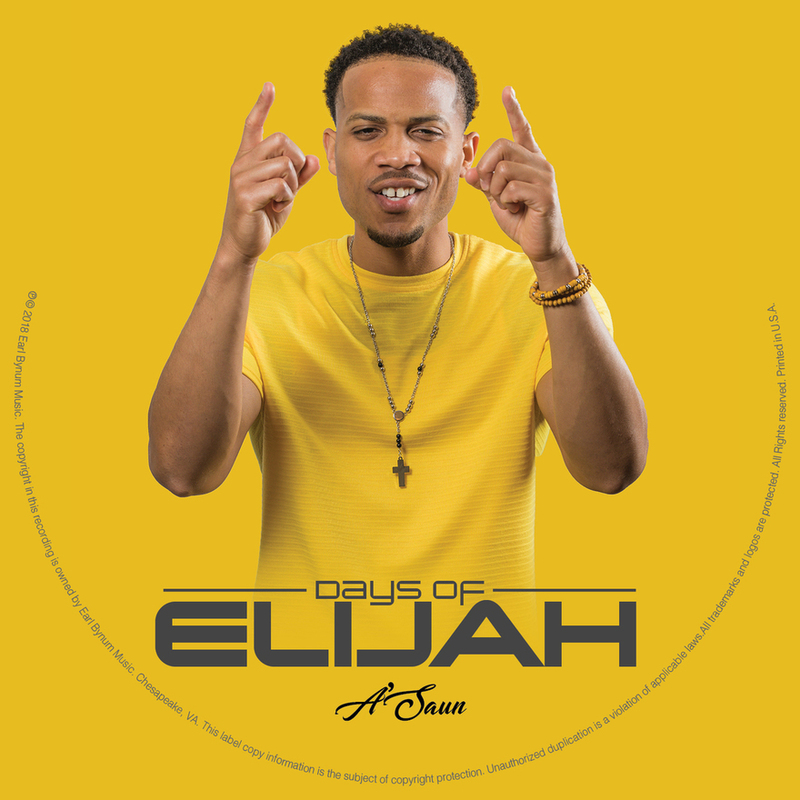 "Days of Elijah" is impacting Gospel radio now with positive reviews and steady adds. “I want to be able to bridge the gap between Gospel, R&B and Contemporary Christian music while staying true to what God has assigned me to do,” says A’Saun. “My desire is to reach everyone where they are, helping bring comfort and peace to whatever situation they may be dealing with. A'Saun refers to John 12:32 (KJV) which states “And I, If I be lifted up from the earth, will draw all men unto me.” A'Saun wants people to be drawn to God by witnessing his own sacrifice, heart, and willingness to serve God in every area of his life.